I may have strong-armed this week's View contributor: Chrissy of Quirky Chrissy. continued to nudge....and nudge....until she committed! And, um, she wrote the perfect piece for this week. You know how, as an adult, you covet the weekends even more than you did when you were a kid? And even more so, you covet the weekends that house your birthday? An unlucky leap year desperately close to your next weekend birthday aside, every 6th and 7th year, you get the joy of celebrating your birthday on a weekend night. No work the next day. No school the next day. Just you and your birthday. And possibly a hangover. This year, my birthday fell on a Friday. My first weekend birthday since May 2009. I was lucky in that the leap year had skipped over a weekday, giving me my weekend birthday a year early. My birthday this year was also the wedding of one of my dearest college friends and his lovely now-wife. As excited as I was for them, it was hard to remove the ego-centric this-is-about-me mentality from my birthday. So I took the day off work and celebrated myself, though Brian (my boyfriend/partner/person) could not join me until later that day. I had the traditional birthday blues, complete with the obligatory cry. Don't you cry on your birthday every year? Or is that just me? I wasn't planning a party. I had dinner plans arranged for the following evening with Brian and the following week with some of my girlfriends, but nothing crazy or big or epic. I had the overwhelming disappointment that it would not be my day. Which was silly. Because it was my day. It just happened to also be someone else's (or two some one's) day. And I was lucky to share that with them. After a delicious pedicure, a flower delivery from my best friend, phone calls, texts and messages from my people, I was ready to be a part of someone else's day. We made our way to the wedding early that evening, but not before Brian could give me one of my presents and a card. Inside the card, Brian had written, "We're going to have a life full of awesome." There was more, but this is what stuck out in my head, even now. Three months later. At the time, Brian and I had just moved into his father's house. We'd been looking for our own house, didn't want the burden of an apartment lease, and had the opportunity to stay in Brian's childhood home while we searched. His father was in Florida and we were in the house, waiting for the house we'd both fall in love with. And Brian was right. Well. Almost right. I hugged him and told him, "We HAVE a life full of awesome." Three months later, I still believe that. Sure, times may be rough. Brian's dad has since moved back into the house with us, and we sometimes feel like guests, since our stuff is mostly in storage. I may not have the job of my dreams, yet. We found the perfect house, but it turned out to be not so perfect. So we cancelled the contract. We're still looking. But every time something bad happens. Every time something goes wrong. One of us will look to the other and say, "A life full of awesome." And that's all we need. That's the mantra that gets us through a house breakup. The mantra that surpasses those days I can't breathe because the humidity is so thick and the air conditioner isn't working. The mantra we go to when we start looking for something and realize it's in storage. With everything else. The mantra I repeat when I can't walk to my closet in the morning because there's not enough room for my clothes. When I break the full bath shower head and need to shower in the tiny closet-sized shower. When I burn myself cooking on the grill because the range isn't hooked up. When I dream of the house with the cabinets and the counter space to house all my small kitchen appliances and snack packs and dishware. I remind myself that this is my life full of awesome. And then I remember that we're living in a fully furnished home. With family. And each other. We have food. And shelter. And clothing (LOTS of clothing). We're looking to buy a HOUSE. So we can build on the life that we've already started creating (and not to start a life, but to BUILD on one that's already full of awesome). We've both got careers at decent companies, and aspirations. We have plans. We have a future. And a life full of awesome ahead of us. Because this is just the beginning. I don't say this to brag. Because it's rather obvious that we do sometimes need this reminder. To remind ourselves that it is a life full of awesome that we're living. And perhaps you, too, can take our little mantra, and live it for yourself. 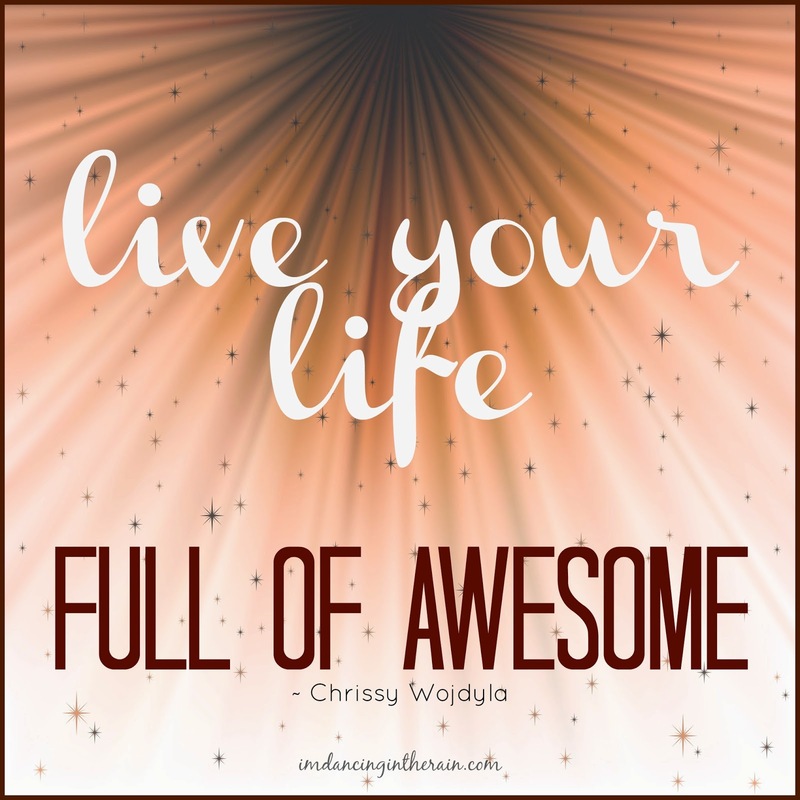 What does your life full of awesome look like? Well, MY life full of awesome looks like THIS. Chrissy, did you just start something? **HEY YOU! I do not have a guest for next week! Do YOU want to contribute YOUR view?